The School Symphony Orchestra boasts a wealth of tradition and many significant achievements. The school orchestra was established and performed for the first time on 6 April 1939, playing Mozart’s Requiem under the direction of Alfons Rösler. The orchestra has always worked under the direction of very good conductors, including Alfons Rösler, Zdzisław Jahnke, Wacław Splewiński and Feliks Rybicki. The orchestra is actively involved in the music life of the region and nationwide. It has taken part twice in the Szczecin Artists’ Gala (1993, 1994) under the direction of Vadim Perevoznikov, and three times in Orchestra Workshops (1992, 1993, 1994) under the direction of Szymon Kawalla and the renowned Swiss virtuoso and teacher Hans Raas. Trips abroad and cultural exchanges with students in Finland and Germany were the crowning points in the artistic work of the ensemble. Since 1996, the orchestra has been conducted by Henryk Wierzchoń. Under his direction the orchestra played more than 60 concerts. The repertoire consisted of approximately 50 works, ranging from the classical period to the contemporary. The School Symphony Orchestra of the State Music School Complex in Bydgoszcz has performed at the National Philharmonic in Warsaw twice – for the first time in 1998 with Valentina Igoshina – the 1st prize winner of the 1st “Arthur Rubinstein in memoriam” International Competition for Young Pianists. The second concert took place in 2001 as part of the celebrations of the National Philharmonic’s 100th anniversary. The soloist was Piotr Żukowski – 1st prize winner of the 4th “Arthur Rubinstein in memoriam” International Competition for Young Pianists. With the Polish-Austrian Society, the orchestra played concerts on the occasion of the celebration of Austria Days (2000, 2003). The orchestra has played many times on the stage of the Pomeranian Philharmonic in Bydgoszcz – during the celebration of the school’s 75th anniversary and during many other school events, and in cooperation with various cultural institutions in the city. 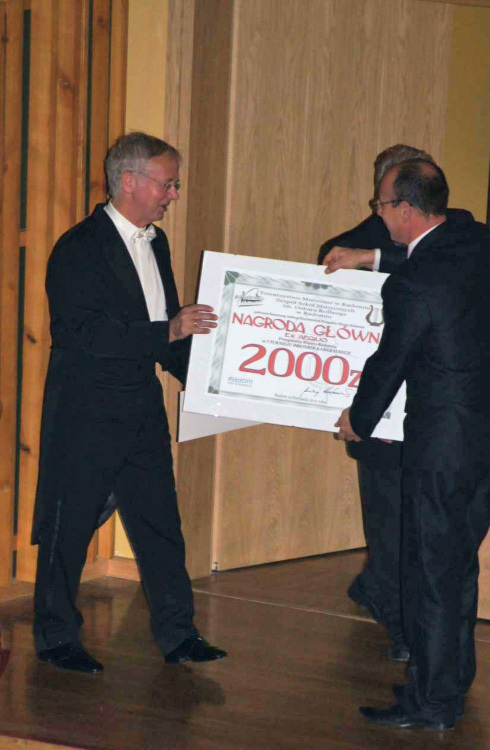 Its cooperation with the Polish Union of Choirs and Orchestras (PZChiO) resulted in the orchestra’s participation in the National Review of Men’s Choirs (2003), in the Musica Pomerania concert (2000) and in the 25th anniversary concert of Children’s and Youth a cappella Choirs (2005). Together with church choirs, the orchestra played a concert on the occasion of the feast of St. Cecilia – the patron of music, which took place in November 2003 in the church of St. Jadwiga in Bydgoszcz. In December 1999, together with soloist Rafał Blechacz, the orchestra concluded the celebration of the 150th anniversary of the death of Chopin in the Polski Theatre in Bydgoszcz, playing Part I of Chopin’s Piano Concerto in E minor. In March 2003 in the “Adria” Theatre, the school orchestra played with jazz drummer Karol Szymanowski to celebrate the birthday anniversary of the city of Bydgoszcz. The orchestra also performed in the Festival of Music Competition Laureates, organised by the Feliks Nowowiejski Academy of Music in Bydgoszcz. The orchestra has been working together with the school choir since 1997. In October 1997 both ensembles played in a concert for flood victims which took place in Dwór Artura in the city of Toruń. In December 1998 the ensemble played Stanisław Moniuszko’s ballad Pani Twardowska in the Polski Theatre on the occasion of the 200th birthday anniversary of Adam Mickiewicz. Also in December 1998, the orchestra and the mixed choir of the State Music School Complex and soloist Antonina Kowtunow played a concert of Christmas carols under the direction of Szymon Kawalla. When in 1999 the School Mixed Choir was transformed into a Female Choir, the orchestra commenced cooperation with the Male Choir of the Salesian General Secondary Music School in Lutomiersk. The three ensembles played many joint concerts and established the tradition of Christmas carol concerts played in Bydgoszcz and in Łódź. In June 2000 the orchestra played extensive selections from works by J.S. Bach and G. Ph. Telemann. In December 2001 the ensembles played Mozart’s Missa Brevis in B-flat major at the Pomeranian Philharmonic on the occasion of the final stage of the “Ignacy Jan Paderewski as Pianist, Composer and Political Activist” competition. The orchestra has recorded a number of CDs. In November 2011 it placed 1st at the 1st Tournament of Chamber Orchestras in the city of Radom. Professor Henryk Wierzchoń has graduated from the State Higher School of Music in Warsaw. He commenced work as conductor and choir leader in the Opera Nova in Bydgoszcz. He prepared the choir for several dozen première performances of operas and concerts. He was involved in the production of operas and operettas and several times held the position of music director. He conducted many stage performances and concerts. In 1989 he established the Chamber Choir at Opera Nova. He has been working as lecturer at the Feliks Nowowiejski Academy of Music in Bydgoszcz since 1985. Currently he is an associate professor in the Department of Music Education. He has led the symphony orchestra in the Artur Rubinstein State Music School Complex in Bydgoszcz since 1996. He has conducted the ensemble in concerts at the National Philharmonic, the Łódź Philharmonic, the Pomeranian Philharmonic and at many festivals. At Opera Nova, he has prepared the opera choir for 43 first performances and 11 masses. Professor Henryk Wierzchoń conducts in Poland and abroad (Germany, Belgium, the Netherlands, France, Malta).